Bound for Jubilee composed by Joyce Eilers. Choir Sacred. SATB choir. Choral Octavo. Sharing Horizons Series. Sacred; Spiritual. Choral Octavo. 8 pages. 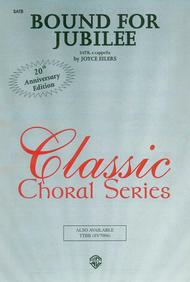 Published by Alfred Music (AP.SV7903).Twenty years ago the name Joyce Eilers was new to the choral writing arena. Today, after two decades of successes was "Bound for Jubilee," a wonderful original spiritual. In celebration of this work and Joyce's first twenty years of outstanding contributions to the choral field, we have released a "20th Anniversary" edition. Introduce this wonderful work to a new generation of singers by adding it to your collection today!